Our winters aren’t nearly as cold as they are elsewhere in the country, which is one of the benefits of living in Southern California. We’ve only just experienced our first serious rainstorm of the winter, and even then, temperatures never dropped below 40 degrees or so. All of that means we don’t always pay as much attention to our heating systems the way we do our air conditioners (which see far more use than our heating systems as a matter of course). And when trouble arises, it can be difficult to notice until a breakdown occurs. It doesn’t have to be that way. In most cases, HVAC systems show signs of trouble before a breakdown occurs. If you can spot them, you can shut the system down and call in a repair service before it becomes an emergency. That saves you time and money, as well as getting the HVAC system up and running again before you need it on the next chilly night. While you should never attempt to diagnose a heating problem yourself – that takes proper training and licensing, since heaters involve potentially dangerous components like gas and ignition switches – you can learn to spot the signs that something is wrong. Several common symptoms occur across multiple different problems, and you don’t need to know what the problem is to take notice and call in a professional. Generally speaking, anything that you fail to recognize as part of your system’s normal functions should be cause for concern. More specifically, here are three common signs of trouble that you should look for. If you spot them, turn off your HVAC system before calling for repairs. An odd noise is the easiest and most obvious symptom to spot in most cases. Your ears have likely been trained to recognize the sounds of your heater when it runs normally. Any change in those noises should be viewed with concern: hums, moans, rattles, clanks and the like. In most cases, they will be centered in the HVAC system itself, though they can echo through the ducts sometimes (and may actually be centered in the ducts themselves, as in the case of a breach). In almost every instance, they will start and stop in time with the starting and the stopping of the system. 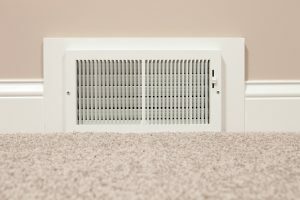 Low air flow can be spotted by feeling the flow of air from your vents and noting when it lowers. A simple means of doing that is to tie a length of ribbon to your vents, then observing if it doesn’t flutter as fiercely as it normally does. Low air flow is caused either by a blockage in the ducts or a problem with the fan apparatus. It’s a problem because it forces your heater to work harder, as well as leaving hot air trapped in the system. Dirty burners, breaches in the ducts, and similar issues can result in air that doesn’t feel as warm as it should. As with low airflow, it adds stress and strain to your HVAC system: resulting in higher bills and an increased risk of repair. For heating repair services in the City of Industry, CA, call Greenleaf Heating & Cooling.